Chapter title is Army of Anger. Luffy won't leave the place. Suddenly, the climate above Big Mom castle drastically changes. Promētheus and Zeus appear above the castle. Numerous army begin marching toward Luffy. Tea Party starts. Big Mom, Pudding and Vinsmokes have a meal together. Pudding is sitting by Sanji and secretly gives him a piece of paper, which says "Let's have a talk with me secretly later." 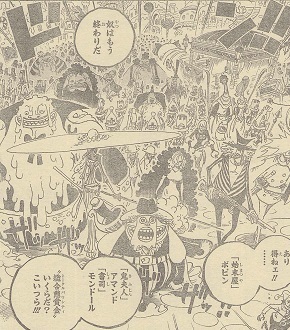 Hundreds of army are approaching Luffy. 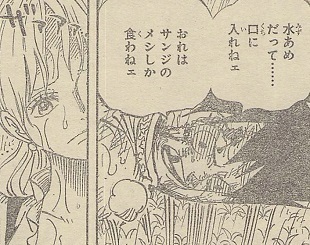 Nami advises him to run away, but Luffy won't accept. Sanji shows his true injured face and handcuffs to Pudding. She apologizes him desperately. Sanji plans to ask Big Mom to let his nakamas go in exchange for him giving up running away. Sanji: I had been in hell until 13 years ago. It would be less sad if I think I come back there again. I was happy because I have been away from hell for 13 years. In short, I owe everyone I met. I'd like to disappear without harming anyone. My adventure is finished now...! Pudding: I won't let our marriage turn into hell! But she instantly apologizes for this word. 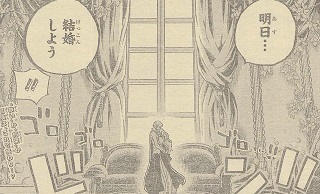 Sanji: You're salvation for me. If you don't mind...let's get married tomorrow. Break next week, soweit ich gelesen habe.